Everything you’ve heard about Black Panther is true. It is a contender for best film in the 18-title Marvel Universe. Despite a 134-minute runtime, you don’t want this ride to end. You get caught up in the action because it isn’t just nonstop effects-driven nonsense with battles that go on too long. The action feels character-driven, and you care about these characters because they’re richly drawn, with so many of them—even the ones without a backstory— sympathetic because of their on-camera interactions and dialogue. That’s one huge thing this film has going for it. Instead of one big nefarious villain there are three antagonists, and that keeps viewers on their toes. Another positive is the blend of technology and primitive mysticism—something that lends itself to the film’s visual style and may remind viewers of Avatar or Atlantis. 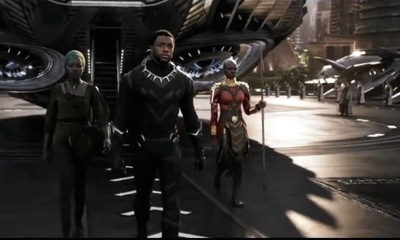 We’re told that long ago a meteorite hit Africa and the rare metal it was made of—Vibranium—had powers that allowed the Wakandans to develop a technologically advanced civilization. 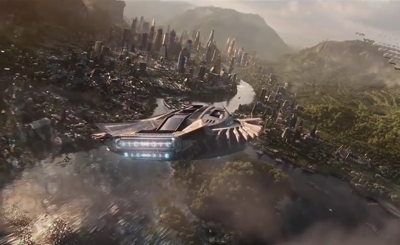 Because they feared other nations would try to steal or abuse the Vibranium, they created a deceptive shield to hide their futuristic world so that, to outsiders, Wakanda would appear to be just another poor Third World country. In the past, an adventurer-physicist named Ulysses Klaue (Andy Serkis, unrecognizable as always) discovered the secret world, stole some Vibranium, and was responsible for the death of T’Chaka, their king and Black Panther. 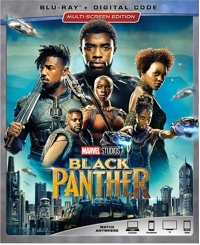 Klaue is at it again, hooking up with other baddies as he tries to penetrate Wakandan security, defeat the new Black Panther, and profit from their technological secrets. If you have flashbacks to Avatar, Atlantis, The Lion King, Tarzan, or even early James Bond films and Eddie Murphy’s Coming to America, you’re probably not alone. There are archetypes at work here that surfaced in all of those films, and the multi-referential aspect adds an additional layer of interest. And while too many superhero plots can seem like exercises in confusion, Black Panther is neither muddled nor insultingly obvious. Chadwick Boseman debuted as T’Challa, the Black Panther in Captain America: Civil War (2016), and that’s very much in the Marvel tradition. His comic-book counterpart first appeared in Fantastic Four #52 in July 1966. Though Lee has denied any political inspiration, it should be noted that the black panther was the symbol of the Lowndes County Freedom Organization that formed in Alabama in 1965 and sought power in numbers by increasing the black vote. Three months after the comic book debuted, Bobby Seale and Huey Newton formed the Black Panther Party in Oakland as a black nationalist, anti-racist, anti-imperialist whose first order of business was to arm themselves as a deterrent against police brutality. And this film begins with one of the Wakandans working undercover in Oakland, with an anti-isolationist message embedded in the screenplay. Even if you don’t pick up on the politics, it’s refreshing to have a predominantly black cast in a film that isn’t an indie drama or slavery tome. 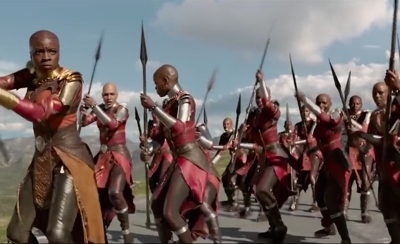 Boseman is terrific as the Black Panther, but Lettitia Wright also kills it as his younger sister Shuri, and Lupita Nyong’o and Danai Gurira are equally wonderful as a spy/quasi-love interest and the head of special forces/bodyguards, respectively. Also look for Get Out star Daniel Kaluuya as T’Challa’s best friend, Martin Freeman cast slightly against type as the Felix Leiter of this bunch, a CIA operative who’s taken into T’Challa’s confidence, and Michael B. Jordan who rivals His Airness for hang time as a former Black Ops soldier and long-lost cousin of T’Challa. There isn’t a weak link in the cast, and maybe because there also doesn’t seem to be a limp line of dialogue anywhere to be found. This one was meant to be seen in 4K or Blu-ray so you can appreciate all the detail. It’s a great choice for family movie night. Director Ryan Coogler (Creed, Fruitvale Station) has created a film that’s so wonderful it’s bound to get repeat play and well worth adding to your home video libraries. It’s a positive film on so many counts, too. Though the title character is a man, Black Panther is really a film that emphasizes the power and equal status of women, and these days that message is more powerful than the herb that gives the BP his superstrength.